As always, the “Just for Fun Avian ID Quiz” is brought to you by Jory Langner, our esteemed Avian Quizmaster. Jory has come up with an entertaining quiz that lets those who spend waaaay too much time looking at field guides a chance to shine. The rules are completely different this time. There is no need to identify any birds at all. And the answers are given at the end of the quiz. How easy can it get! 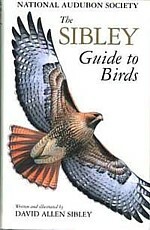 One of the most popular field guides in North America these days is The Sibley Field Guide to Birds by David Allen Sibley. For this quiz, we are using the “big” version, which covers both east and west. My edition indicates Sixth Printing, September 2001. What is the first species described? What is the last species described? What bird is depicted on the front cover? What birds are depicted on the back cover? What bird is depicted on the inside front flap? On the inside back flap, there is a picture of David Sibley. What color shirt is he wearing? Ivory-billed Woodpecker – is it described in the main body of the text or is it listed as extinct in the Introduction? The field guide has 545 pages. On what page do sparrows begin (approximately)? The field guide has 545 pages. What group of birds is shown in the exact middle of the book (on pages 272-273)? As he describes it “in the narrow view”, how long did David Sibley work on this guide? 10 correct: We don’t believe you anyway! The answers are below. No peeking! Feel free to post your rating in the comments. Hope you enjoyed the quiz and remember to leave your rating in the comments. Sigh. You forgot a category in your scoring. 0 because you don’t own the book – Loser! Be kind of interested in how the experts “REALLY” did on this quiz. Corey/Mike/Charlie,and some of the other full time birders and bird bloggers what level did you fall into. I was a 0 like Liza not owning the book. Oh, and come on folks, you have to be able to get #3 right…it’s right there in front of you! You threw in the towel because you don’t own the book? Where’s that gumption that all birders show when they’re tracking down a bird? You’re not thinking hard enough, even if you don’t have the guide or don’t know it well! Call me misguided (pun intended), but I’d think that there are 5 questions that you should be able to get exactly correct, or approximately correct. 1 – What’s the first bird listed in a field guide? … You should at least get LOON, maybe not the exact species. No? 3 – As Corey said, there’s a picture right there! 7 – Ivory-Billed Woodpecker extinct? I indicated that my book was printed in 2001 … before the (possible) re-discovery of the bird, so ‘extinct’ is the correct answer. 8 – Sparrows, in all the guides I’ve ever seen, sparrows are approximately 80% near the back of the book. Just as warblers are a little earlier in the guide. 9 – Owls, usually about half way through the guide. And after all the correct answers on the harder quizzes … sigh, I”ll just have to go back to harder quizzes!